There’s this secret hideaway at the back streets of Blackfriars you should be aware of. Lunch times you can smell the freshly baked Genoa style Focaccia in the air in the alleyway. You will not be able to spot this on the street; it is hidden behind the back alleyway, next to a pub, and the churchyard. Get The Focaccia is a special place for you to purchase golden crisp Focaccia, freshly cooked pastas to order, and Italian desserts. Get The Focaccia is straight up with their philosophy, Italian food is best served simple with freshly prepare ingredients made each day. My favourites have to be the pastas; each day there is a different option for meat or vegetarian. Once you made your order you can watch the chef cook your pasta right in front of your eyes, while you wait, tossing and flipping the pasta in the pan, adding and mixing in the sauce. Once finished plating the dish topping it with Parmesan shavings. The added bonus is getting a free piece of focaccia bread with every order, the focaccia bread itself is a golden crisp brown with a soft inner crumb, seasoned with olive oil and salt. The pasta is superbly rich in flavour, I usually at Get The Focaccia when they have Ragu on the menu, lean diced beef, and plum tomatoes, with handfuls of chopped onions, carrots and celery. Pasta is cooked perfectly, without tasting uncooked or too soggy. I say the small portions will fill you up a lot, the large I get through three-quarters and give up. 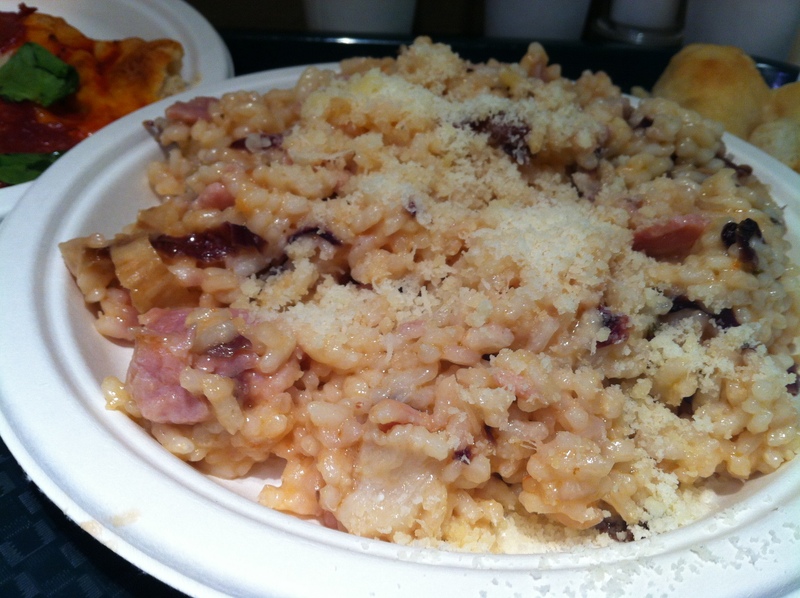 Other specials to look out for at Get The Focaccia are their Risotto on the specials board. Fabulous! North Italian rice cooked in an ultra creamy consistency, soaked with all the flavoursome broth. Each bite leaves you wanting more; I still dribble thinking about it. 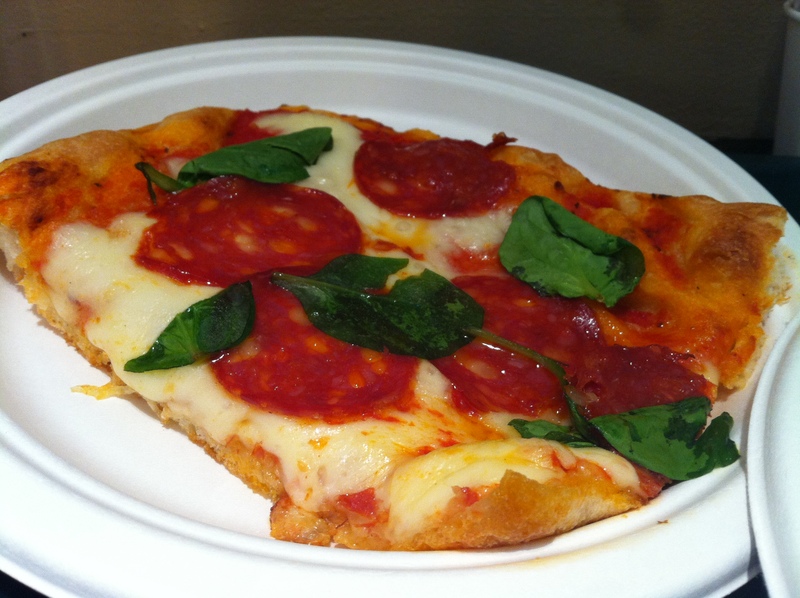 Focaccia pizza’s makes a great snack; the seasoning is simple, tangy tomato base, topped with fresh ingredients and melted stringy mozzarella cheese. A slice sets you back to £3.90. Get The Focaccia is worth the trouble to get to, superb hidden gem in Blackfrais. Pastas from £4.75, Risotto £4.95, delicious focaccia’s and sweet things. 🙂 I used to work in the area, it is a very hidden spot, hard to find unless you know of the place.